When I was a young boy, I always enjoyed the turning of the calendar pages from April to May. It may have been only a signal of the approaching end of the school year and summer vacation looming in the distance. The main event for May, however, was the fact that it was Mary’s month. There was always the festive May Crowning in the church and the procession led by the Children of Mary, the Marian Sodality, and the Junior Holy Name Society. The Sisters of St. Joseph of the Third Order of St. Francis (from Stevens Point, teaching in Chicago) made sure that the classrooms of both the elementary and the high school were festooned with a “regulation” statue of Our Lady of Grace and fresh flowers from a local garden. The daily prayers always included either the Regina Coeli or the Angelus as determined by Easter or Ordinary season. The May Crowning in Church always featured the Act of Consecration to the Immaculate Heart of Mary—a major event led by our Pastor (of happy memory) Monsignor Smaza. The high school girls in “Our Lady’s Court” were arrayed in multi-colored (prom) gowns, the younger girls of this or last year’s First Holy Communion class in white dresses and boy’s in blue suits. All the children carried white calla lilies. It’s funny how so much of the symbolic nature of our rituals and sacramental expressions come to us through “the rear-view mirror” of time. As we enter the month of May, we need to refocus ourselves on some of the life of grace that lies before us. So many elements of Catholic devotional life have been lost by our lack of time or, more pitiable still, our lack of enthusiasm and will. Each time I celebrate the Sacrament of Confirmation in our Diocese, I present the newly confirmed with a rosary made by the hands of our children at our mission home in Peru, Casa Hogar Juan Pablo II. I am frustrated that they look bewildered or indifferent when I tell them of the beauty of the rosary as a prayerful communication with our Mother. The rosary is part of our Catholic DNA—and should be renewed. I believe that prayers and devotions such as the rosary need to come back into prominence in the spiritual lives of Catholics. I often introduce the gift of the rosary to the young people by reminding them that the rosary is not jewelry for the dead or a pop culture accessory. May could be a good time to help emphasize that point in your home by praying the rosary together at least once during Mary’s Month. Another very significant consideration is the daily recitation of the Morning Offering—the first prayer we offer when we wake up at the beginning of the day. Morning prayers and night prayers seem to many of us, old fashioned or out of step with our hurried lifestyles. Again, Mary’s Month may be a time to reignite some of those forgotten habits. Praying to Jesus through Mary reminds each of us of the love that God has for His Mother and the joy it can bring us to love Her, too. Pope St. John Paul the Great dedicated himself and his entire papal ministry to Jesus through Mary—“Totus Tuus”—or “totally yours.” His life of service in the Church and the great example and spiritual creativity he gave as pope captivated the minds and hearts of many people—especially the young. Hopefully that example will not be lost as we grow older and search newer trends and social developments. This entry was posted in Uncategorized on May 4, 2018 by dioceseoflacrosse. O God, who gladden us year by year with the solemnity of the Lord’s Resurrection, graciously grant, that, by celebrating these present festivities, we may merit through them to reach the eternal joys of Heaven. Hi everybody, Bishop Callahan here. Christ is Risen! He is Risen Indeed! Yes, Christ has risen from the dead and we have reason to believe! For two thousand years, and here in our diocese the past one hundred fifty, people of Faith have been marking for us the anniversary of Christ’s brutal passion, His death, and His Glorious Resurrection from the dead so that we will remember – Jesus Christ, God the Second Person of the Blessed Trinity, loves us. His love for us was made real by his resurrection, and also through the gift of the Holy Spirit. The Holy Spirit is an expression of the Love between God the Father and God the Son. The outpouring of the Holy Spirit animates the Church, and animates us. When we reflect on the Gifts of the Holy Spirit and use them to guide our lives, we are allowing ourselves to be open to the Will of God. Easter is a time for us to celebrate the great gift we have been given! Make it a point to share the Easter Joy with those around you. Easter is also a time for us to deepen our awareness of the presence of the Holy Spirit in our lives, and to pray for the strength we need to merit the promise of eternal joy in Heaven. This entry was posted in Uncategorized on March 31, 2018 by dioceseoflacrosse. O God, who desire not the death of sinners, but their conversion, mercifully hear our prayers during this observance of Lent, that we may gain pardon for our sins and a newness of life. Hello everybody, Bishop Callahan here … reminding you that the essence of the virtue of penance is a conversion of heart toward God and away from sin. The Church gives us this season of Lent as a time to focus on a certain part of our faith and make an effort to deepen our understanding through fasting, prayer and almsgiving. This year I’d like to invite you to examine the virtue of penance. … Are you ready to open yourself up to a deeper conversion of heart toward God and away from sin? Jesus Christ came to earth to save us from sin and give us the means to forever live with him in the happiness of heaven. It is by His Grace that we are inspired to know, love, and serve Him here on earth. It is with great Hope that we attempt to amend our lives and to be open to receiving His Divine Mercy. Take time to examine your conscience, and make time to go to confession. Let this Sacrament of Grace be a source of strength and a haven of peace. Experience His healing power and re-claim focus for your life. Rend you hearts and not your garments! Blessed Lent to you. Let us be ready to receive the Easter Joy together! This entry was posted in Uncategorized on February 28, 2018 by dioceseoflacrosse. Allow me to remind you that Wednesday, February 14, is not only Valentine’s Day—but, more importantly, it is Ash Wednesday. “O, my goodness,” you may say and point to the boxes of Christmas decorations that you haven’t had chance to bring back to storage. Yeah, I realize that may be an exaggeration. Nevertheless, since keeping track of time, or at least trying to be punctual, has become such a part of human obsessiveness, I’m concerned that we seem to have lost sight of the passing of time that concerns itself with the management of our spiritual lives. At one point in human history the management of all life was based on the Church calendar—the preparation for the major feasts of Christmas and Easter in particular. That concept seems lost on the current age. Another problem presenting itself for us this Ash/Valentine Wednesday is the situation involving fast and abstinence and how we are expected to deal with this very important element of Lenten discipline. In the modern age, we have become accustomed to the fact that if St. Patrick Day occurs on a Friday in Lent, typically there will be a dispensation from the abstinence from meat—especially if the local Ordinary is of Irish descent. Ash Wednesday marks the beginning of Lent and sets the boundaries for the entire season that determines the great penitential and sacrificial time of the Church year. Catholics have recognized Ash Wednesday as the start of Lent for over a thousand years. The last time Ash Wednesday fell on February 14 was in 1945, well before the secular celebration of Valentine’s Day became such a bacchanal. The next time this will happen will be in 2024, and then again in 2029. So, I strongly urge that if you are planning a celebration of Valentine’s Day with your husband, wife, or special someone, please do so the day before. Centuries have given this time over to Mardi Gras, so there is no problem in choosing it as your time for a special night out. Keep in mind that Catholics throughout the world recognize Ash Wednesday as the solemn beginning of prayerful reflection and penance as evidence by the large number of the Faithful who take advantage of coming to Mass and being signed with Ashes as a symbol of the brevity of life and the call to personal reformation. In any event, the idea is to be with the one you love for both Ash Wednesday and Valentine’s Day. Your day will be infinitely blessed by making these choices wisely. Blessed Lent to all of you! This entry was posted in Uncategorized on February 13, 2018 by dioceseoflacrosse. Yes, I think we’ve all seen the commercials about the advantages of vacations in Las Vegas—peace, quiet, and privacy. No one of us expects the horror of evil to be a part of our fun or our participation in an event such as a Country Music Festival. We mourn the deaths of our brothers and sisters who were gunned down by a very deranged man who ultimately took his own life—all this at the beginning of October, Respect Life Month. When will we learn? Let us pray for our beloved dead and for those who were wounded in this latest affront to God’s gift of life. Eternal rest grant unto them, O Lord; and let perpetual light shine upon them! God grant peace to the deceased and to their families; and may Almighty God grant physical and emotional healing to all who have been so adversely affected by this cruelty. This entry was posted in Uncategorized on October 4, 2017 by dioceseoflacrosse. Dear brothers and sisters, I am so happy that we maintain a strong spiritual bond with our brothers and sisters at Casa Hogar in Peru. Not only is there the strong financial support we provide through the Fr. Joseph Walijewski Legacy Guild, but also there is our strong union through the Rosary promotion that is offered by the boys and girls who make the rosaries that I am happy to give away at our Confirmation ceremonies across the Diocese. As young people in our Diocese receive the Gifts of the Holy Spirit, they are drawn more deeply into the mystery of love shown to us in the consolation of our meditation on the life of Grace offered to us in the recitation of the Rosary. I remind our young people (and all those who attend our Confirmation ceremonies) that the Rosary is not “junk jewelry,” nor is it an “accessory,” for dead bodies. Praying the Rosary unites us with the Biblical realities of our Blessed Lord’s life among us, and offers us the opportunities to meditate on those realities with our Blessed Mother. This is a strong part of the devotional life of the Church. Devotion helps us to energize our faith with a personal sense of attachment to Jesus and Mary, in this case; but devotion energizes us with strength to enter more deeply into personal relationship with each of the Members of the Blessed Trinity and with all the saints. Disassembling our prayer through the mediations of the Rosary, we come to a deeper awareness of our relationship with Jesus and Mary and enter into the reality of their life and their genuine human experiences that lead us more predictably to their sharing of divine experiences with us as well. Saint Francis of Assisi and Saint Ignatius of Loyola were great champions of imaginative prayer, or the opening of the mind and heart to the contemplation of a Scriptural passage by placing oneself in its midst as a participant. In Francis’ case, one of the most stirring examples is the formation of the Christmas crib—or Francis’ “real life” version of his imaginative prayer about the Nativity of Our Blessed Lord. For Ignatius, we have the “Spiritual Exercises” used by countless men and women for retreats over the years; or the “Consciousness Examen,” trusted as a means of daily prayer and personal “self-correction” for one’s daily life. These forms of prayer bring us into the area of contemplation and meditation used by saints over the centuries of active and genuine faith. October is traditionally held as the “Month of the Rosary,” particularly noting the feast of Our Lady of the Rosary on 7 October (established by His Holiness Pope Pius V after the victory of Christian forces in the Battle of Lepanto in 1571) as the epicenter of the devotion. 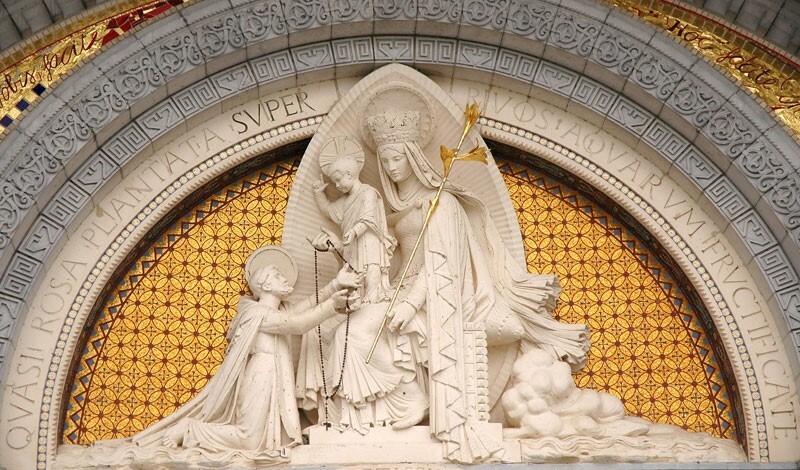 I must further remind you once again, that the Church celebrates 2017 as the 100th anniversary of the apparitions of Our Blessed Lady at Fatima. Both of these events are very significant for Christian and world civilizations for without the victory at Lepanto and the warnings given at Fatima—both done under active involvement of Our Blessed Lady, and both accomplished by the praying of the rosary by virtue of Her direct instruction—the world, as we know it, would be an extraordinarily different place! Battles fought hundreds of years ago, apparitions of Mary, happening a hundred years ago, do not seem to phase us much these days; nevertheless, there is a strange nexus in the power of evil and the lives of all humanity, that seems to bubble and hiss in the cauldron of contemporary society threatening once again and with even greater ferocity to spill out, scalding and destroying our fragile lives. I urge you, my dear brothers and sisters, pray the Rosary! Be active in your devotion to the Mother of God. She has been involved—over centuries—in the affairs of humanity and has warned us about so many aspects of our silliness and empty pursuits. She has been right—everytime! This entry was posted in Uncategorized on October 2, 2017 by dioceseoflacrosse.